Copper is a metallic element which is malleable and ductile in nature with excellent heat and electric conductivity as well as high resistance to corrosion and microbes. Copper occurs naturally in the earth’s crust in a variety of forms. Copper originating from ores is called primary copper. Copper is one of the most recycled of all metals. Recycled copper is called secondary copper. Copper and copper?based alloys are widely used in a variety of applications that are very crucial in day-to-day life. Copper alloyed with zinc is called brass. Bronze is an alloy of copper and 12% of tin and other trace elements such as aluminum or manganese or nickel. When alloyed with other metals, copper can acquire new characteristics. This makes it suitable for use in highly specialized applications. Chemical, physical and aesthetic properties of copper make it a material of choice in a wide range of domestic, industrial and high-technology applications. The rising demand for copper would be met by improvements in the mining technology, efficient designs of ore processing, and discovery of new copper reserves. According to the United States Geological Survey (USGS), worldwide copper reserves stood at around 720 million tons in 2017 and undiscovered copper reserves are estimated to stand at around 3,500 million tons. In Europe, the total number of copper reserves is very negligible and these reserves fail to meet the rising demand for copper in the region. Copper is the only metal that does not lose its chemical and physical properties after recycling. Producers in the region have decided to take advantage of this and meet the increasing demand for copper with the help of circular economy of copper. The term ‘circular economy of copper’ refers to renewable nature of copper led by its reuse and recycling. The used copper products are recycled to extract copper and the extracted copper is re-used to manufacture new products. Copper is considered a contributor to the GDP of developing as well as developed countries. Copper mining, recycling of copper, and transformation of the processed metal into a diverse range of products create jobs and contribute to the GDP of a country. 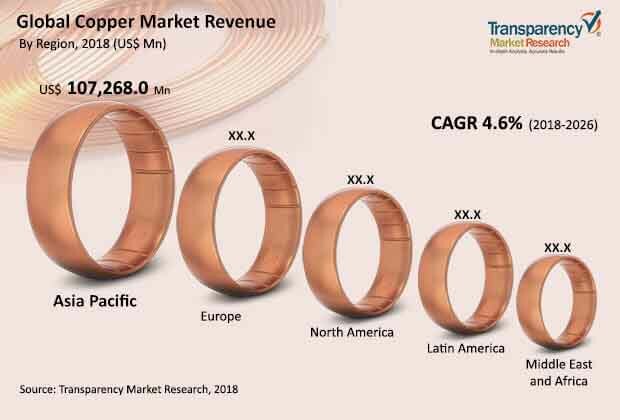 In terms of revenue, the global copper market is anticipated to expand at a CAGR of 4.6% from 2018 to 2026 and reach value of US$ 222.1 Bn by 2026. The global copper market has been segmented based on type, form, and application. Based on type, the market has been segregated into primary copper and secondary copper. The secondary copper segment is expected to witness significant growth during the forecast period. Based on form, the global copper market has been segmented into wire rods, plates, sheets & strips, tubes, bars & sections, and others. The wire rods segment held a leading share of the global copper market in 2017 and is expected gain a significant market share by the end of the forecast period. Based on application, the global copper market has been classified into construction, transportation, appliances & electronics, power generation, distribution and transmission, and others. The others segment includes ammunition coins, machinery, and defense. Copper has exceptional mechanical properties such as ability to be cast with high precision and tolerance, durability, and machinability. This makes copper-based alloys the best choice for products such as gears, bearings, and turbine blades. The construction segment accounted for a leading share of the global copper market in 2017. It is likely to remain a dominant segment throughout the forecast period. The power generation, distribution and transmission segment is anticipated to expand at a rapid pace between 2018 and 2026, followed by the construction segment, in terms of both value and volume. Asia Pacific dominated the global copper market, holding more than 65% of the market share in 2017. It was followed by Europe and North America. China constituted a key share of the copper market in Asia Pacific, in terms of both volume and revenue, in 2017. Presence of major copper refineries and secondary copper manufacturers and increase in the demand for construction led by rising urbanization in the country are driving the demand for copper in China. The copper market in North America, Europe, and Asia Pacific is expected to expand at a high CAGR during the forecast period. On the other hand, the copper market in Latin America and Middle East & Africa is projected to expand at a sluggish pace during the forecast period. The report comprises profiles of major companies operating in the global copper market. Key players operating in the market are Codelco, Rio Tinto, Glencore International AG, Freeport McMoRan Inc., Jiangxi Copper Corporation, BHP Bilition, Antofagasta Plc., Group Mexico, and Aurubis. Other prominent players in the copper market are Vedanta Resources Plc, Sumitomo Metal Mining Co. Ltd, LS-Nikko Co., and Tongling Non-Ferrous Metals Group. The report also comprises a matrix of comparison between four top players operating in the global copper market along with market share analysis for 2017. On September 27, 2017, the International Copper Study Group partnered with the Common Fund for Commodities, the International Copper Association, and the International Copper Promotion Council (India) for technology transfer in a project titled ‘High-pressure Copper Die Casting in India’. The project is related to the manufacture of rotors and motor systems by using high-pressure copper die casting parts that are highly energy efficient in nature. Copper is one of the widely used metals since ancient times. Copper tools have helped civilization to emerge from the Stone Age. Copper has significantly contributed to development of the society from early stages of human race. Copper is the only metal in the earth’s crust that is available in its pure form. In the nature, it is found in different forms such as copper sulfide ores. Copper is a crucial component of electricity infrastructure, machinery, and digital communications across the world. Voice, data, and information systems rely on copper wires due to high electric and thermal conductivity of copper. Copper is used in wind energy and solar power industries as well as energy-efficient buildings and electric vehicles, as it has higher strength-to-weight ratio compared to steel. Copper is also employed in medical applications and drinking water infrastructure, as it has antimicrobial properties. Among applications, the construction segment held a major share of the global copper market in 2017. The trend is likely to continue throughout the forecast period. Copper structures are used in the construction sector in the form of building facades, doors, frames, windows, and canopies. Copper can withstand extreme weather conditions and can bear high compressive loads. Major government, commercial, and residential buildings use copper for their rainwater harvesting systems and roofing. Transportation is likely to be the second-largest application segment of the global copper market from 2018 and 2026, owing to high demand for copper in sectors such as automotive, marine, and new-generation airplanes & trains. At present, an average mid?size automotive vehicle contains about 22.5 kilograms of copper, while high-end luxury cars contain around 1.6 kilometers of copper wires on an average. Asia Pacific held a significant share of the global copper market in 2017, in terms of both value and volume. The region is expected to continue its dominance throughout the forecast period. China is a highly lucrative market for copper in Asia Pacific, followed by India and Japan. Growth of automotive car production and construction sectors across the globe is a driving factor for the global copper market. The automotive sector in North America is expanding at a significant rate. This, in turn, is anticipated to offer lucrative opportunities to the copper market in the region. Europe is expected to gain market share during the forecast period. The market in North America is likely to expand at a significant pace in the near future. The market in Latin America and Middle East & Africa is likely to expand at a sluggish pace in the near future. This report analyzes and forecasts the market for copper at the global and regional levels. The market has been forecast in terms of revenue (US$ Mn) and volume (kilo tons) from 2018 to 2026, considering 2017 as the base year. The study includes drivers and restraints of the global copper market. It also covers the anticipated impact of these drivers and restraints on the demand for copper during the forecast period. The report also highlights opportunities in the copper market at the global and regional levels. The report includes detailed value chain analysis, which provides a comprehensive view of the global copper market. The report also comprises a list of key manufacturers and top 10 copper-producing countries in the world for 2017. Regulatory landscape has also been included so as to offer different standards and regulations used in copper mining and handling across countries/regions. Porter’s Five Forces model for the copper market has also been included to help understand the competition landscape of the market. The study encompasses market attractiveness analysis, wherein type, form, and application segments have been benchmarked based on their market size, growth rate, and general attractiveness. The study also includes pricing analysis based on type and region. The study provides a decisive view of the global copper market by segmenting it in terms of type, form, and application. In terms of type, the market has been divided into primary copper and secondary copper. In terms of form, the market has been segmented into wire rods, plates, sheets & strips, tubes, bars & sections, and others (ingots, powder, etc.). In terms of application, the copper market has been segregated into construction, transportation, appliances & electronics, power generation, distribution and transmission, and others (ammunition coins, machinery, defense, etc.). These segments have been analyzed based on the present and future trends. The regional segmentation includes the current and forecast demand for copper in North America, Europe, Asia Pacific, Latin America, and Middle East & Africa. The report provides the actual market size of the copper market for 2017 and the estimated market size for 2018 with forecast for the next eight years. The global copper market has been provided in terms of revenue (US$ Mn) and volume (kilo tons). The market size has been provided for the global, regional, and country-level markets. The report comprises profiles of major companies operating in the global copper market. Key players operating in the copper market include Codelco, Rio Tinto, Glencore International AG, Freeport McMoRan Inc., Jiangxi Copper Corporation, BHP Bilition, Antofagasta Plc., Group Mexico, and Aurubis. Other prominent market players include Vedanta Resources Plc, Sumitomo Metal Mining Co. Ltd, LS-Nikko Co., and Tongling Non-Ferrous Metals Group. The report also comprises a matrix of comparison between the top four players operating in the copper market along with their market share analysis for 2017.